The cotton fields – which are still abundant between Decatur and Florence, Alabama – were peaking and startlingly beautiful with their fluffy and practical white yield as my friend Anne and I made our way to the Alabama Chanin factory and the last dinner of the 2017 season (www.alabamachanin.com). It was in this in-between area, around the community of Trinity, that I was one of many volunteers that helped out for a morning or a day with Alabama Chanin and Billy Reid’s 2012 experiment in growing organic cotton in north Alabama. 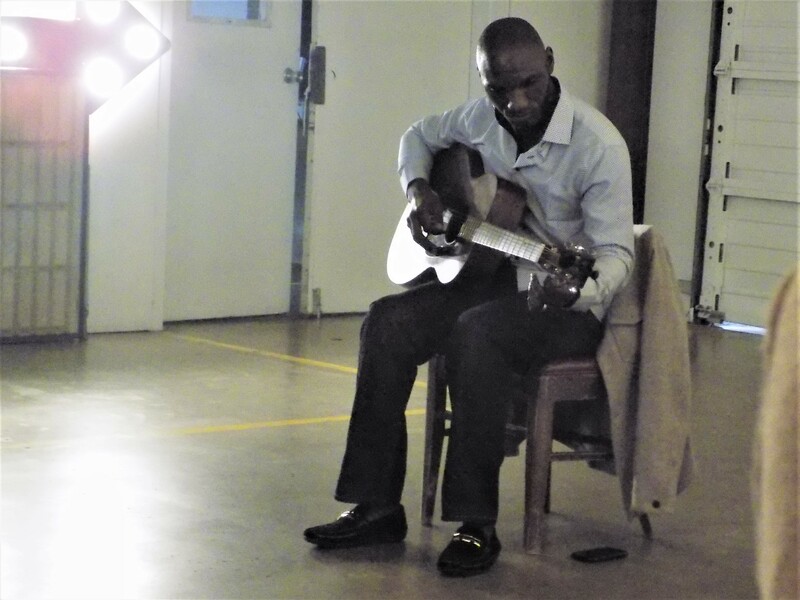 With the industrialization and outsourcing of cotton harvesting, working the field was a “back to the roots” experience which helped me to recognize and honor the hard work of my own relatives who worked the cotton fields and harvests of their own Alabama farms in the first half of the twentieth century. Inventive souls are finding new uses for local cotton these days, including downtown Birmingham’s Redmont Distillery which features an “Alabama Cotton Gin,” a spirit which is “distilled through Alabama cotton” and infused with other local product (www.redmontdistilling.com). 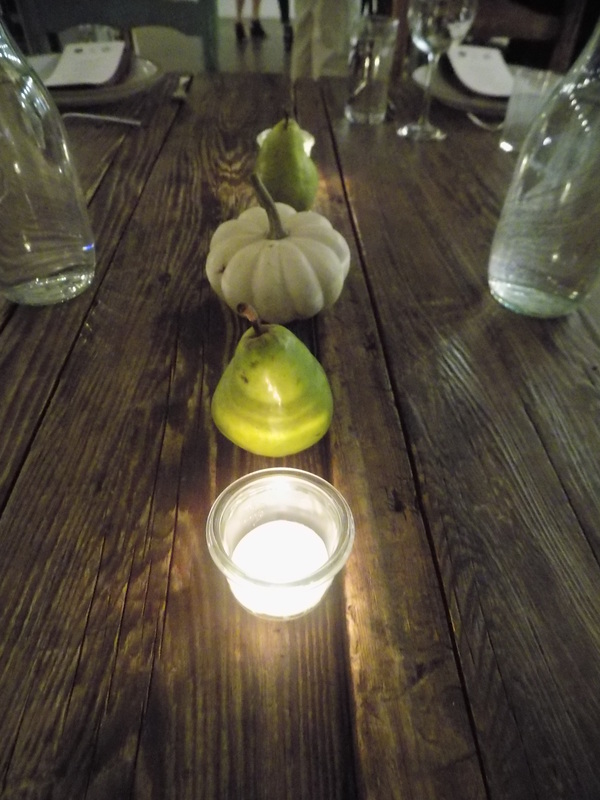 The most recent Alabama Chanin dinner was a celebration of the fall harvest, helmed by Ray Nichols, the new in-house chef for the Café at the Factory, who comes with an already impressive resume and who, before joining Alabama Chanin, was at Odette, a charming dining spot in downtown Florence. It was a rich season of Friends of the Café meals starting with Chef Scott Peacock re-emerging for an Easter season event and moving forward with the return of Chef Ashley Christensen for her second meal of the series. In August, in conjunction with the Billy Reid Shindig, Chef Asha Gomez presented a meal combining her American Southern experiences with her roots in southern India. Chef Nichols’s dinner was a sold-out mix of locals, regulars, and new faces. Our friend Carol from Chicago showed up accompanied by a charming Chicago friend. We met guests from Hawaii and Colorado and a yoga master from Gray Bear Lodge in nearby Hohenwald, Tennessee. I have written before that there are times when the former tee-shirt factory in the industrial section of Florence seems like the center of the universe; chance meetings and serendipity abound. Young Chef Nichols impressively held his own with his predecessors with a hearty dinner featuring the harvest of the region along with a couple of tasty imports, like Conway Cup oysters from Prince Edward Island. The mildly briny oyster was topped with a Harvest Roots kimchi from Mentone, a scenic village on Lookout Mountain in northeast Alabama. The oysters on the half shell were pass-arounds at the start of the evening along with deviled eggs topped with a Harvest Roots curtido. The pre-dinner beverage was served in a brown sugar-rimmed glass partially filled with cider from Florence’s Singin’ River Brewery. The cider was cut with Prosecco and the drink was finished with a splash of Sangria. 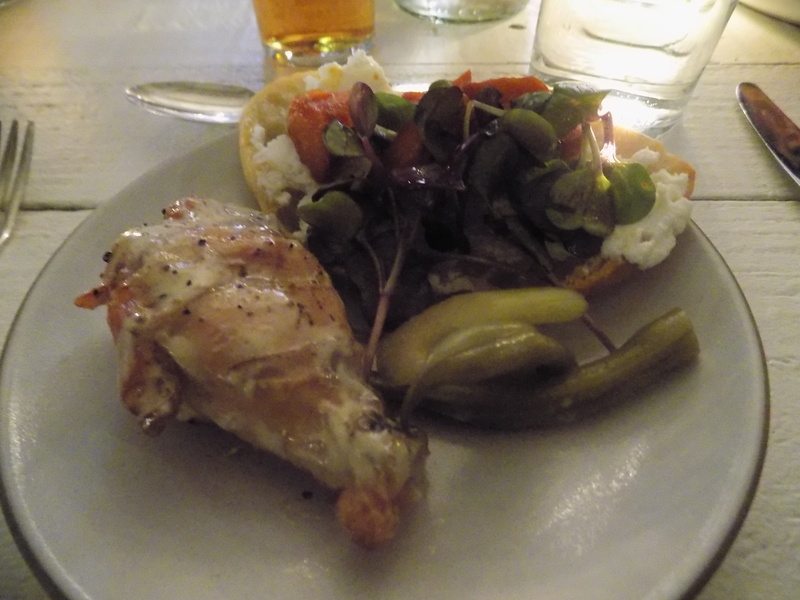 When the guests were seated and the preliminary introductions were completed, platters of smoked chicken wings, pickled vegetables, and toasts topped with Bonnie Blue goat cheese were served family-style. The chicken was coated with a white sauce (this is, after all, north Alabama), and the goat cheese was from Waynesboro, Tennessee, just off the Natchez Trace. A harvest salad with an abundance of greens and local harvest from area farms was served next with a burnt honey–sweet potato dressing. 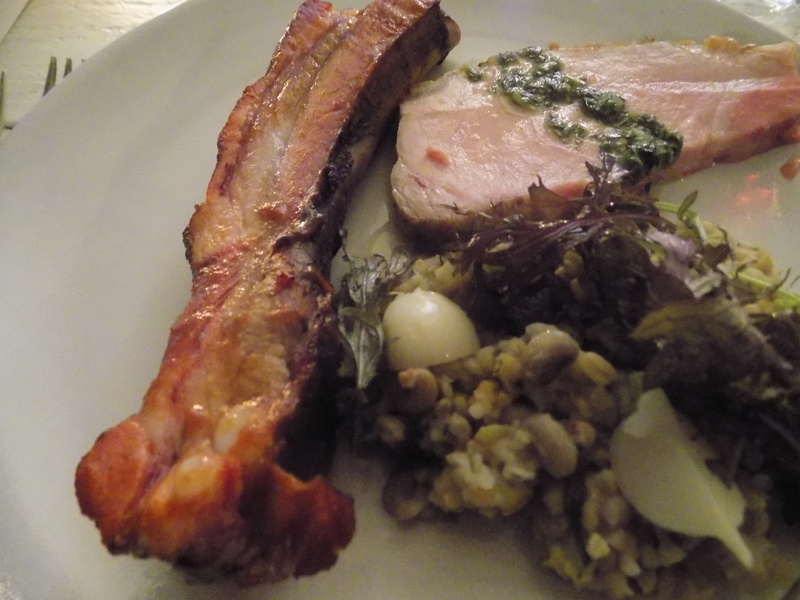 The main course featured Bear Creek pork served two ways. A large and tasty pork rib was presented alongside a ham steak. Both were accompanied by farro verde, turnips, and muscadine. The dessert lived up to its preamble. 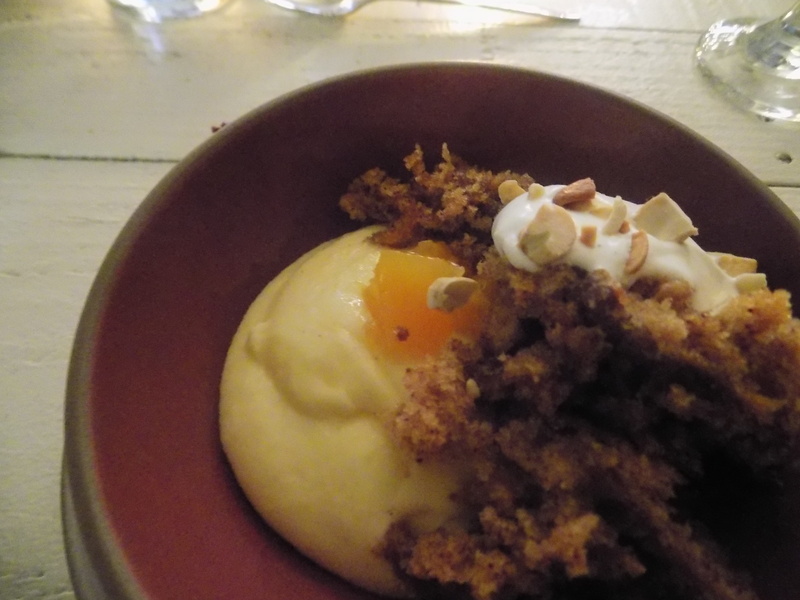 A crumbly sweet potato cake and a creamy semolina pudding were garnished with cashews and citrus. 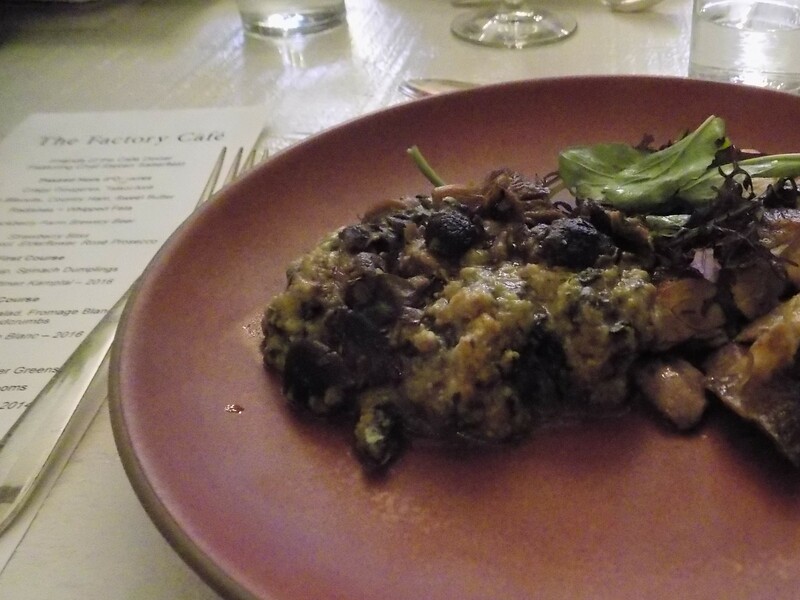 Ray Nichols’s debut for an Alabama Chanin factory special dinner was a triumph with every bite, heralding a bright new presence in the Factory kitchen that will maintain and enhance an already impressive standard. The yoga master asked me at some point during the evening if I spent my time going from one amazing dining experience to another. I wish … but no, I do not. Such evenings are few and far between in my schedule and each is anticipated with pleasure. I feel rejuvenated and ready to face the day to day challenges when I have the opportunity to eat an amazing meal in a singular place in the company of delightful people. This entry was posted in Alabama Chanin Factory and tagged Alabama, Alabama Chanin, Alabama cotton, Alabama harvest, Chef Ray Nichols, Florence Alabama, Redmont Distillery on October 24, 2017 by gedwardjourney. Sustenance does not come only from food and drink. In my own food memory, I am sustained by vivid recall of meals I had, with whom I had them, the service and the conversation and the ambience of the room; sometimes, though, when I remember such an event, I have only a vague recall of what I actually ate – only that the meal itself was an indispensable part of the memorable event. 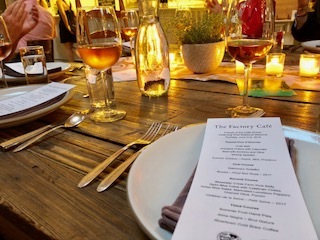 Natalie Chanin’s “Friends of the Café” dinners at her Alabama Chanin factory in Florence (www.alabamachanin.com) provide many levels of sustenance – only a part of which comes from the food and drink and the amazing chefs that create them. 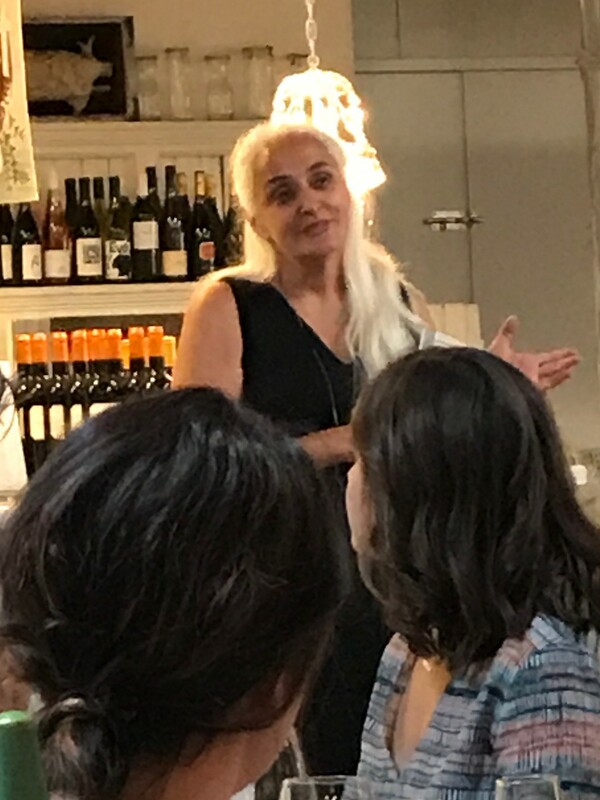 My most recent Florence dinner was helmed by Asha Gomez, a native of India who has been in the United States for several decades and who has been creating food memories in Atlanta for most of the past ten years. The Gomez “Friends of the Café” dinner on a Thursday in August anticipated the beginning of Billy Reid’s annual “Shindig” weekend. Reid, the other internationally acclaimed fashion designer based in Florence (www.billyreid.com), hosts a late summer event featuring his clothing line, concerts and screenings, and chefs and meals in various venues that create a “go to” weekend for arts, fashion, food, camaraderie, and innovation in the Shoals. 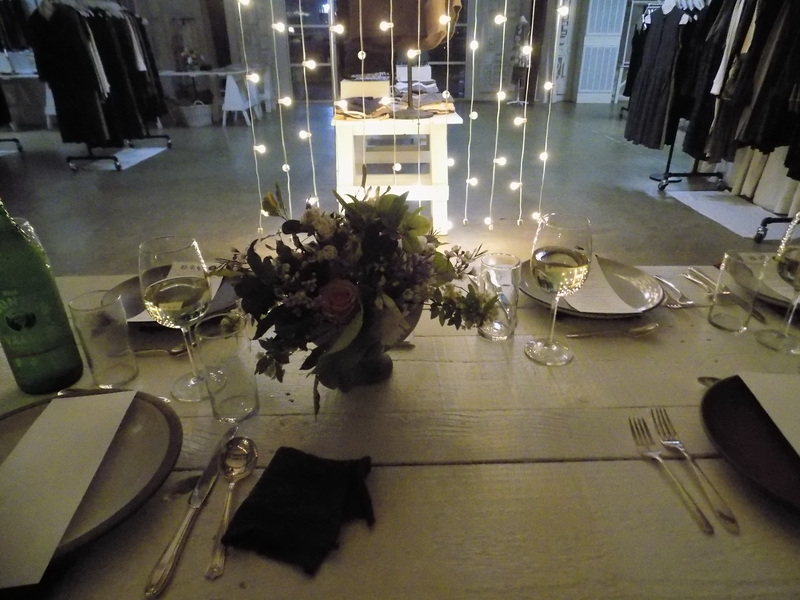 Alabama Chanin’s pre-Shindig dinner is always sold out and includes the regulars who travel from near and far for her dinner as well as fashion, food, and entertainment professionals in town for Shindig. The sustenance comes from being in a place where forward-thinking Southerners and others are gathered together and one realizes that – despite the headlines and political turmoil and despite the international joke that Washington, D.C. has become – we are not alone. 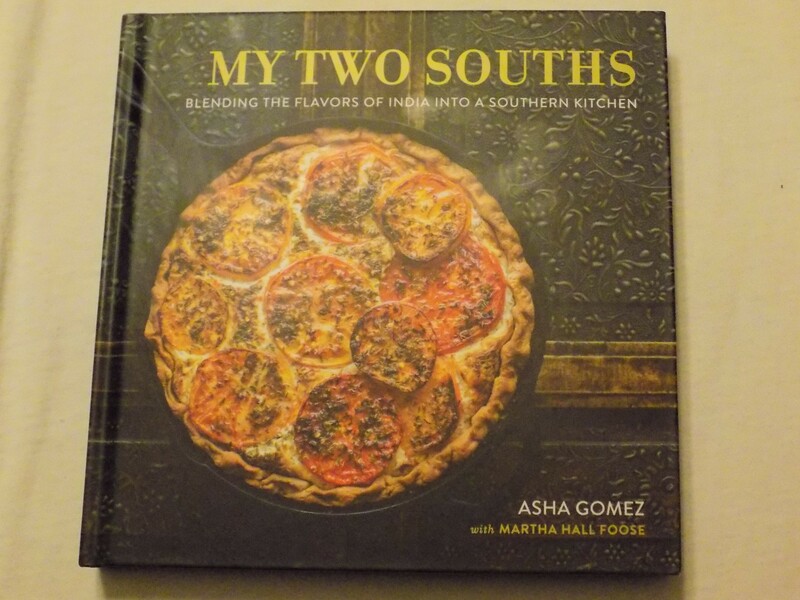 Gomez’s book on cooking, My Two Souths: Blending the Flavors of India into a Southern Kitchen (Running Press, 2016), is an honestly detailed journey into her life and how her two souths, southern India and the American South, have created the sensibility of her aesthetic and cuisine. In her opening comments preceding the dinner, she balked at the word “fusion” – calling it “the other f-word.” Her food is personal, evolving from her roots in Kerala, India, and ever-expanding with the discovery of new foodways, new ingredients, and the commonalities contained therein. For Gomez, Southern fried chicken was nothing new; she brought her own strong tradition of fried chicken from Kerala. Gomez claims both Southern India and the Southern U.S. as “home” and her food is a reflection and immersion into the rich compatibility of those shared homes, shared and unique flavorings, and Gomez’s personal interpretation of all of it. Gomez understands why someone like me might be skeptical about Indian cuisine. I have been known to say that it is my least favorite of the international cuisines readily available in the States. I like the taste profile, the ingredients, and the spices of Indian cuisine well enough but have never been enchanted with its presentation in many Indian restaurants I have tried – usually at the urging of more enthusiastic friends. Gomez knows that the cuisine of her homeland is not represented by “the $4.99 buffets” and other iterations common to the American landscape and seeks to exalt it in a more authentically representative manner. Cindy was sitting beside a group of pastry chefs and other food professionals from New Orleans and the hilarity was pretty much non-stop off to my right side. The evening commenced with hearty passed hors d’oeuvres including black pepper and black salt spiced roasted cashews, fry bread with mint chutney and quick pickled carrots, and curry chicken samosa pockets. The featured beverage, the “Muscadine Vine,” was a combination of muscadine wine, vinho verde. Prosecco, lime, and mint which successfully tamed and enhanced the tricky sweetness of muscadine wine. 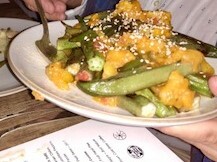 A first course of Sunday Vegetable Stew featured chunky vegetables in a lovely coconut milk base. A Kerala Fish Curry with kichidi grits and tempered mustard oil was the second offering. 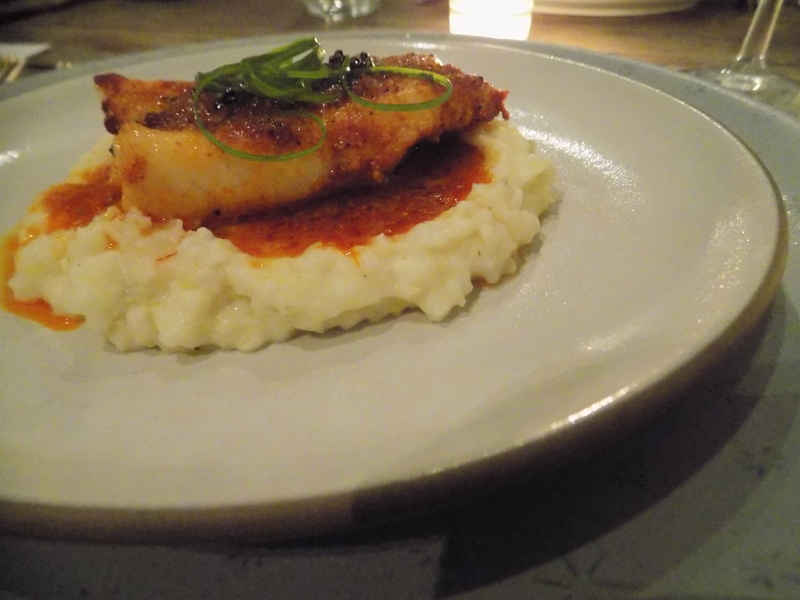 The fish beautifully rested on a lush bed of perfectly seasoned and perfectly cooked grits and the sauce melded the flavors in a pleasing manner. Beef Biryani was the third course, served family style. In My Two Souths, Gomez describes biryani as a “celebration dish” and describes the traveling biryani chefs of India as being similar to American barbecue pit masters. Her version for the recent dinner featured chunks of beef over rice with an intensely diverse panoply of spices and seasonings. 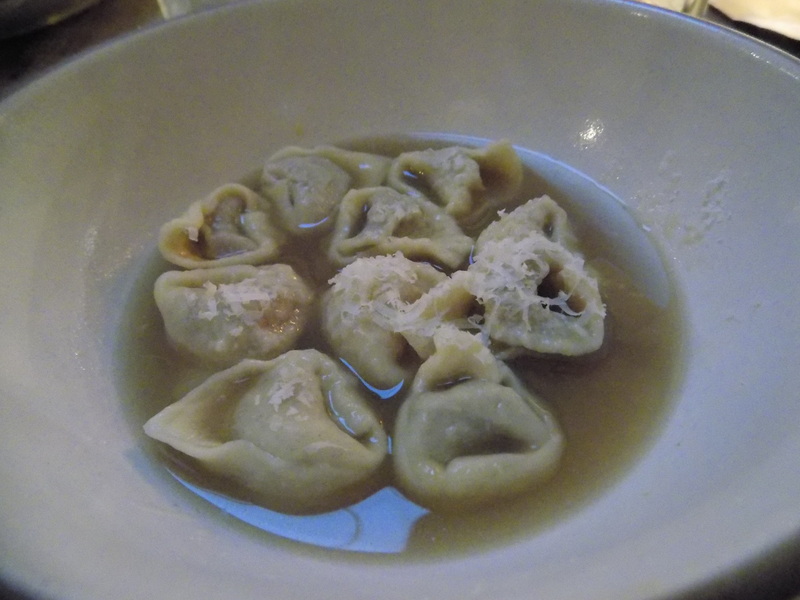 Each course was accompanied by a complementary wine pairing. After three very hearty and satisfying dishes, the undisputed star for the diners at my table seemed to be the dessert course. 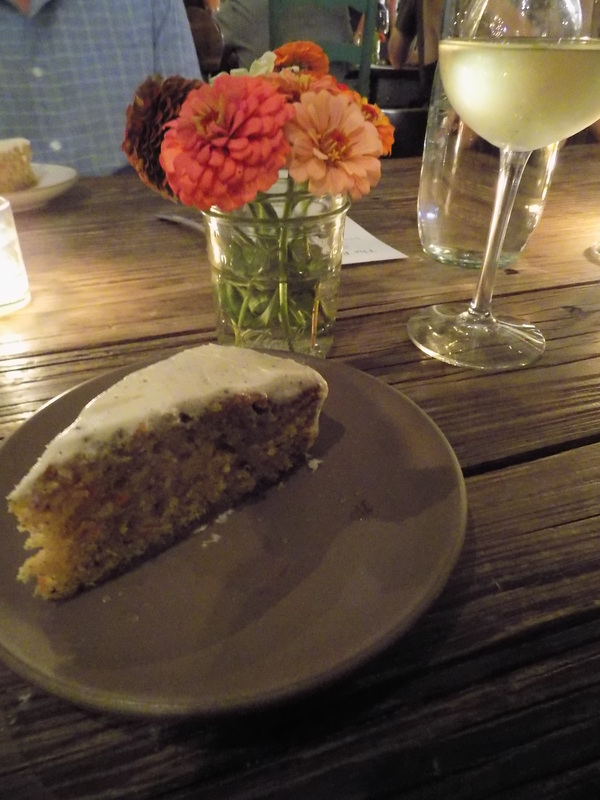 The Three Spice Carrot Cake arrived to a chorus of delighted responses and the first bite did not disappoint. The sustenance of the evening came to fruition with the sustenance of the actual meal that brought us all together in a spirit of community and enlightenment. 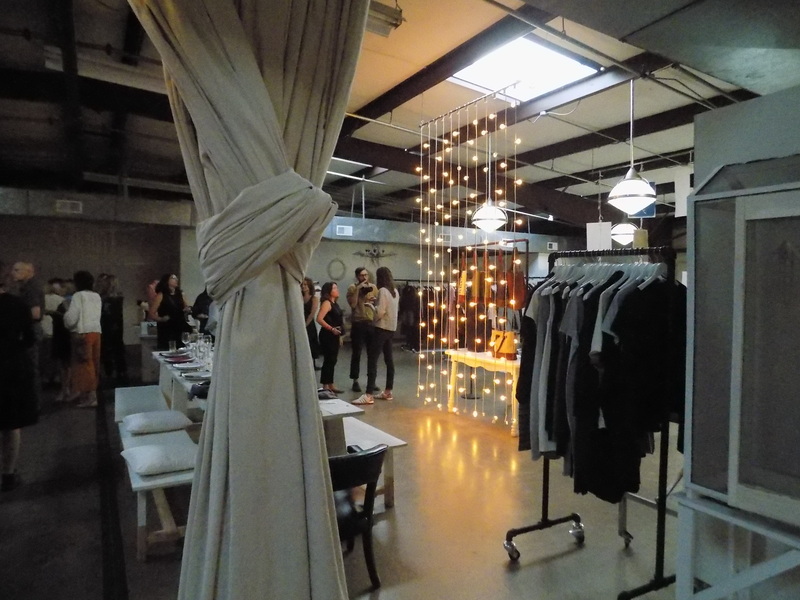 During Edge’s opening remarks about the Southern community being forged throughout the region by forward-thinking people of all stripes, Natalie Chanin quipped about it being found “in a former tee-shirt factory in the industrial section of Florence, Alabama.” She was right. 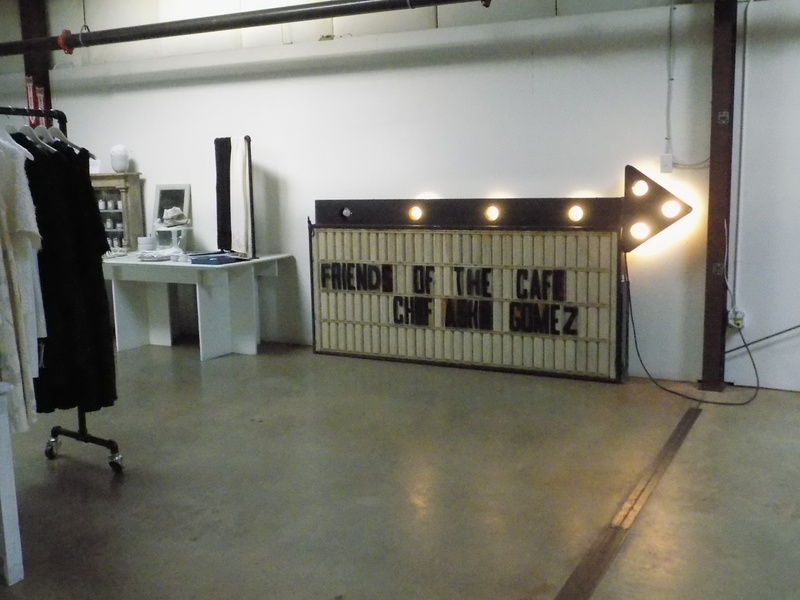 The “Friends of the Café” events are forging that community three or four times a year at her factory and in events like Shindig. I always leave these events with rejuvenated inspiration. I admit that I still have a somewhat wary relationship with Indian cuisine, but Asha Gomez has opened my mind and broadened my perspective. Indian restaurants may not become my first dining choice, but I will eagerly consume and find sustenance in the boundary-breaking cuisine of Asha Gomez. This entry was posted in Asha Gomez and tagged Alabama, Alabama Chanin, Alabama Chanin Friends of the Cafe, Asha Gomez, Billy Reid fashion designer, Billy Reid Shindig, Florence Alabama, Indian cuisine, John T. Edge, My Two Souths by Asha Gomez, Natalie Chanin, Southern Foodways Alliance, The Potlikker Papers by John T. Edge, the Shoals on August 28, 2017 by gedwardjourney. The first day of Summer 2017 ushered Tropical Storm Cindy up from the Gulf and energized the air farther inland in Birmingham, where I was helping to celebrate my mother’s birthday. It has been a few years since I experienced the typical effects of a tropical storm and – while I always hope there is no significant damage or injury – I always find the balmy air and windy bands of sporadic rain to be invigorating and energizing. I reread The Great Gatsby as I have done for years on the Summer Solstice. I was in my twenties when I began my annual reading of The Great Gatsby and the ritual has almost taken on a superstitious nature; if I missed a year, I would feel like something was awry. But I always manage to get in my June reading of the book and, after dozens of readings, I always find something new in Fitzgerald’s writing. And my heart always pounds in anticipation of the book’s inevitable ending. On this most recent reading, I was struck near novel’s end by Nick Carraway’s account of a recurring West Egg nightmare – “a night scene by El Greco” in which a bejeweled drunken woman in a white evening dress is borne on a stretcher by “four solemn men in dress suits” to the wrong house. “But no one knows the woman’s name, and no one cares.” That particular paragraph had never stopped me in my tracks until this reading. Perhaps that passage stood out this time because I read it while sitting in a car in the parking lot in Tuscaloosa in a steady tropical rainstorm, while Mother was in a beauty shop appointment. Those meteorological conditions just added to the gloom of Gatsby’s rain-soaked funeral in which he is laid to rest with only Nick, Gatsby’s father, a few servants, the local mailman, and the owl-eyed former party guest in attendance. I usually reread Gatsby outdoors in the sunlight so the weather definitely added a different perspective this year. ­­­­­­­­­­­­­­­­­By the time Saturday afternoon rolled around, the weather had cleared and the balmy weather turned blistering. Summer’s advent and Cindy dominated the days leading up to the most recent Friends of the Café event at the Alabama Chanin Factory in Florence (www.alabamachanin.com). North Carolina chef Ashley Christensen of Poole’s Diner and other Raleigh dining venues (www.ac-restaurants.com), was helming the meal. 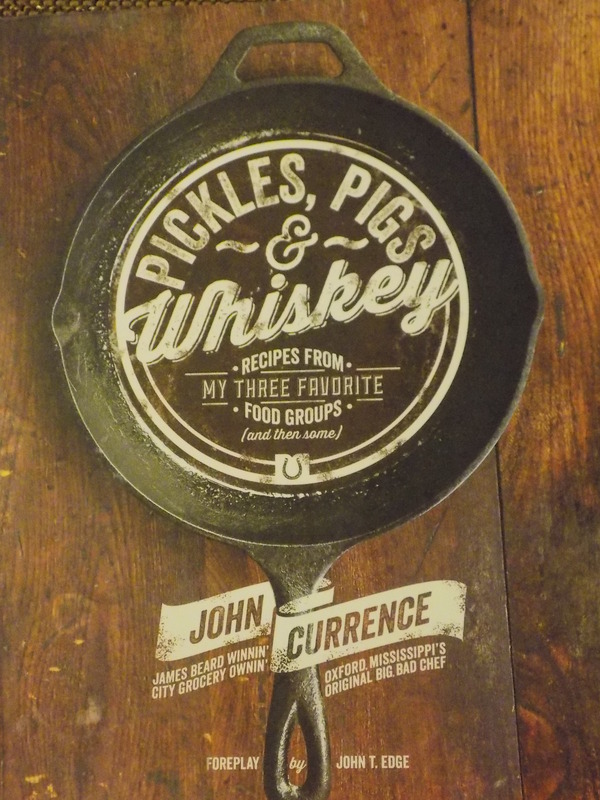 Once again, the event was a benefit for Southern Foodways Alliance (www.southernfoodways.org). I am proud to be a long-time member of the SFA, helping in a small way to support all of the good works the organization does. Friends Anne, Michelle, Scott, and I traveled to the Shoals for the meal. Arriving at the Factory we were warmly greeted by Natalie Chanin, the creative force behind Alabama Chanin and the impetus for many community-building events, including an awesome schedule of Friends of the Café dinners. The gathering was already going strong when we arrived. A delicious array of passed hors d’oeuvres included fried green tomatoes topped with Alabama jumbo lump crab salad and Hook’s three-year cheddar pimento topping a cucumber slice. Along the serving table were shots of a sweet corn mousse with piquillo pepper. The mousse literally melted in one’s mouth like a passing dream of sweet corn taste. A “Summer Cindy” libation was poured – Prosecco and Jack Rudy grenadine with a sprig of rosemary. 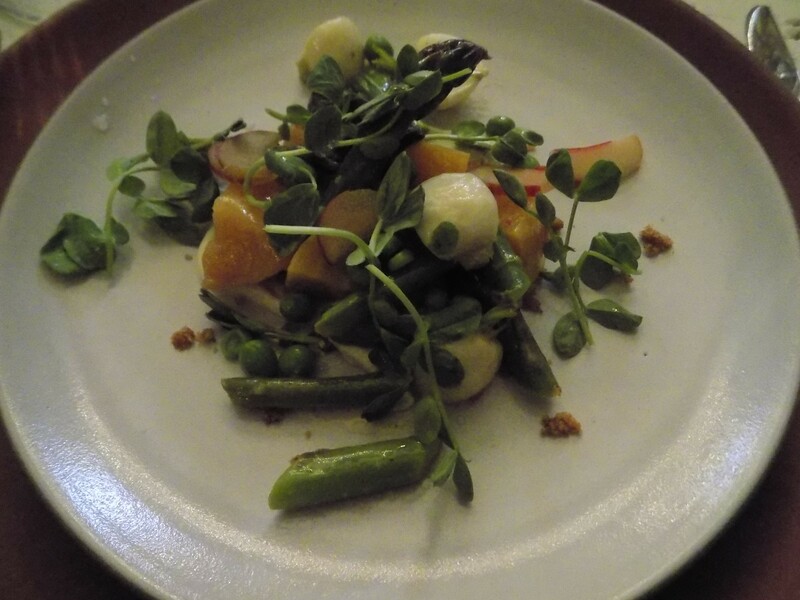 The seated meal began with a salad of local lettuces and vegetables dressed with buttermilk and roasted garlic. 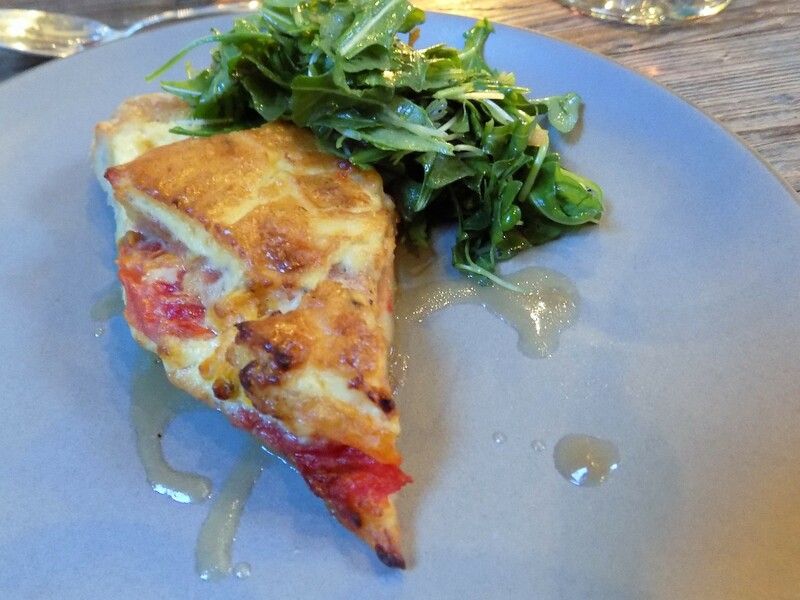 Next came a slice of heirloom tomato pie with spicy greens and sherry. My quest for the perfect tomato pie began years ago with the tomato pie competition that was an annual event at Decatur’s Willis-Gray Gallery (now Kathleen’s). The Decatur event hasn’t been held in several years but Ashley Christensen’s take on tomato pie is now the hands-down winner. 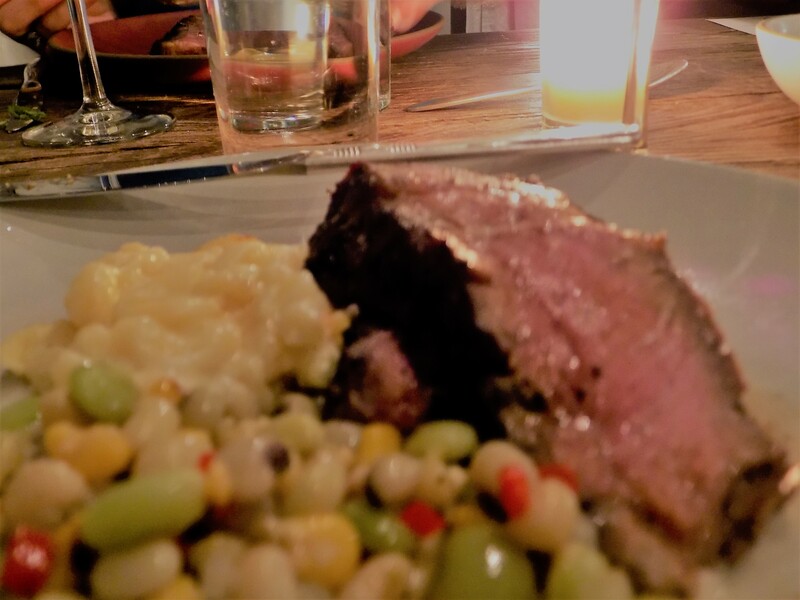 The third course was chargrilled Bear Creek ribeye steak cooked perfectly and served family style along with Poole’s macaroni au gratin and a room temperature marinated summer succotash which brought back vivid memories of my Grandmother Harbison’s take on hearty southern succotash. 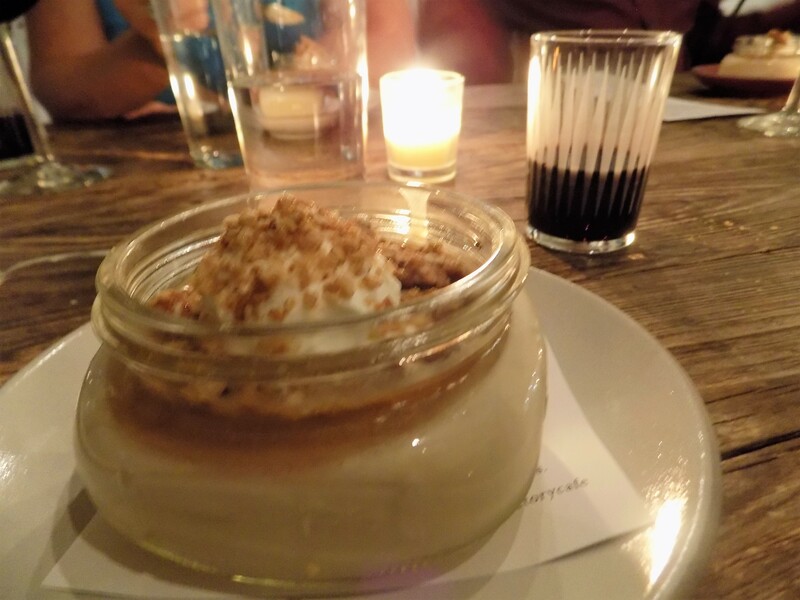 The dessert course of a coffee panna cotta with Irish whisky caramel and North Carolina pecan granola crunch was served with a deep and earthy port. I have never been disappointed in a meal at the Factory and Christensen’s recent menu continues to raise the bar. Christensen seems to be as warm, down-to-earth, and authentic as the carefully selected ingredients she elevates. I think I have attended all but three of the Friends of the Café dinners and Ashley Christensen was the chef for my second in 2013. When Natalie Chanin asked me recently which had been my favorite of the meals over the years, Ashley Christensen’s name was one of the first that came up. 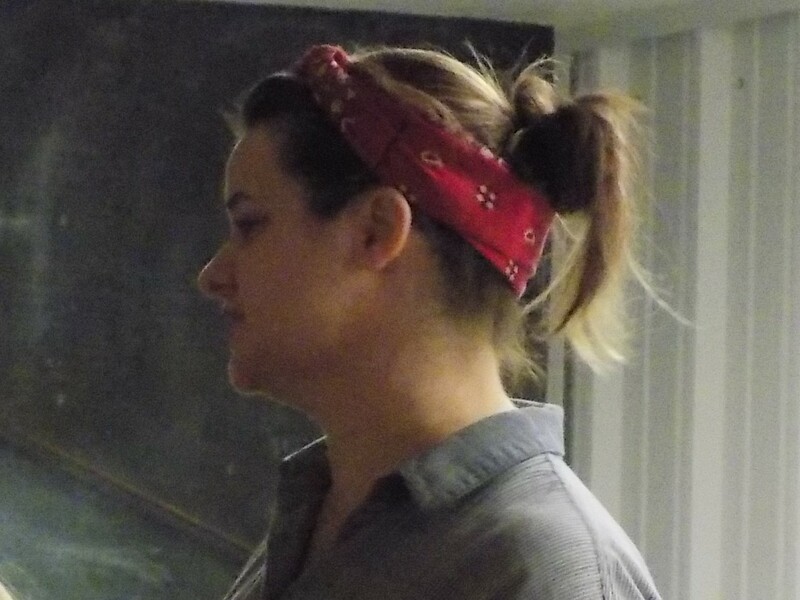 Now, Ashley Christensen is the first of the guest chefs in the series to come back for an encore. It seemed unlikely that she could top her first memorable performance at the space, but last Saturday night she did. Copies of Christensen’s cookbook. 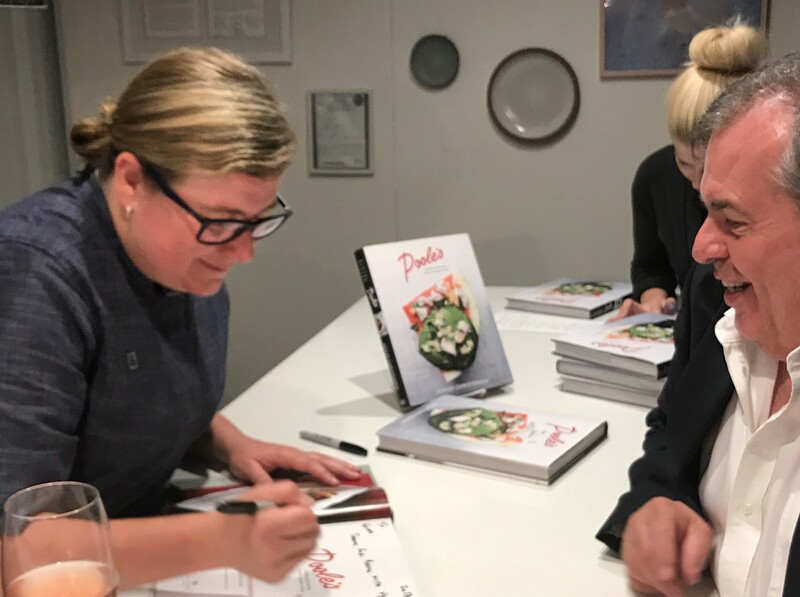 Poole’s: recipes and stories from a modern diner (Berkeley: Ten Speed Press, 2016), were available for purchase and signing at the end of the event. It is a cookbook chock-full of exciting, well-explained recipes as well as a good introduction to the founding of Poole’s and to the James Beard Award-winning chef’s culinary aesthetic. It also provides the stories and impetus behind her restaurant empire of seven downtown Raleigh establishments. Chanin referred to her friend as “badass” and the book is full of Christensen’s warm and earthy takes on the food world (she refers often to an affinity for “beer flavored beer”). For me, thanks to the friends who went with me, to Alabama Chanin, and, especially, to Ashley Christensen, that turbulent first week of summer 2017 ended on a high note indeed. 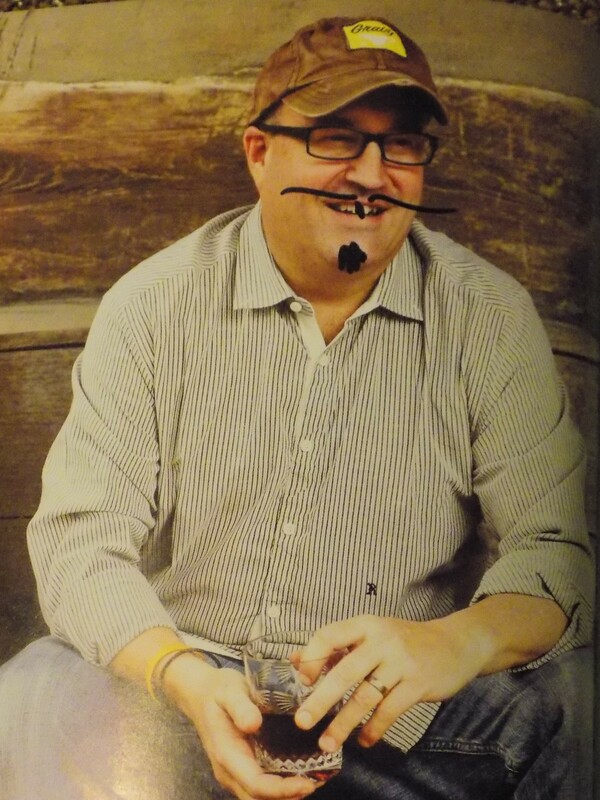 This entry was posted in Chef Ashley Christensen and tagged Alabama, Alabama Chanin Friends of the Cafe, Ashley Christensen, Florence Alabama, Natalie Chanin, Poole's: recipes and stories from a modern diner, Southern cookbooks, Southern Foodways Alliance, The Great Gatsby, the Shoals on June 27, 2017 by gedwardjourney.